The ASA Caravanserai is a unique pictorial compilation of Saluki events and history over a five year period. Each volume contains formatted pages combining a pedigree, photo and comments; half-page memorials; and a feature section on the ASA Celebration and Perpetual Trophy winners for each of the year of the Caravanserai edition covered. 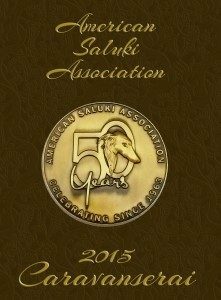 The books are published every five years and feature Salukis from around the world. They are an important reference for anyone interested in the breed. Books shipped within the US are $70. Books shipped outside of the US are $85. A limited number of older editions of the Caravanserai are available and for sale. Please refer to the Older Publications section for edition availability and prices.